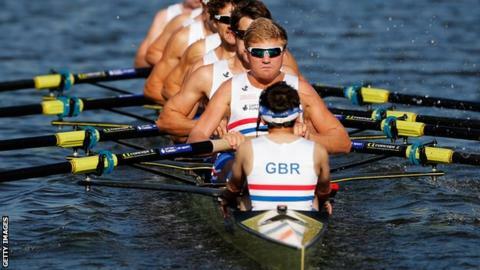 Great Britain won silver and bronze in the non-Olympic class events on day six of the World Rowing Championships. Alan Sinclair and Scott Durant won silver in the men's coxed pair in Amsterdam, behind New Zealand's Eric Murray and Hamish Bond who claimed their fifth world title as a pair. Sam Scrimgeour and Jonathan Clegg won bronze in the lightweight men's pair. However, the lightweight women's four finished out of the medals in fifth as the Netherlands defended their title. The eight finals taking place on Friday were classed as international events and are not part of the Olympic programme. "That was a great performance from Alan Sinclair and Scott Durant to win silver. It was always going to be a hard task to win gold because Eric Murray and Hamish Bond have been so dominant. To beat them, you need to get a length ahead at 500m - and no-one has ever managed to do that to the Kiwis. Sam Scrimgeour and Jonathan Clegg have been going well all season and that kind of performance means the quartet currently in the lightweight four, which is an Olympic class boat, can't rest on their laurels." However, they provide an opportunity to gain valuable experience competing on the world stage and impress selectors in the hope of getting promoted into an Olympic class boat. Blustery conditions greeted the field on day six of the eight-day regatta, with a cross-tailwind resulting in a number of world's best times set during the medal races. Sinclair and Durant, coxed by Henry Fieldman, were in contention with Bond and Murray at 500m of the 2,000m course before the New Zealanders powered away. Sinclair said: "We knew they would push out in front after 500m. We anticipated that and kept our focus very much on our own race." Bond and Murray went on to win in a world's best time of six minutes 33. 26 seconds, 10 seconds clear of the British pair, with Germany third. It was their 19th consecutive title as a pair and extends their winning streak to 55 races, stretching back to 2009. Scrimgeour and Clegg, who only came together as a duo for the European Championships in May, led at 500m, but faded as the race went on to finish behind Switzerland and France. The lightweight quad of Ruth Walczak, Ellie Piggott, Brianna Stubbs and Charlotte Taylor struggled in the opening half of the race and could not recover, finishing 14 seconds down on champions the Netherlands. The men's quartet of Mark Aldred, Peter Chambers, Richard Chambers and Chris Bartley were pipped to the line by Denmark in a fast semi-final but second was enough to qualify for Sunday's final. "We went faster than any other British lightweight men's four has gone. Obviously you would like to win but qualifying was the aim and that wasn't the finished article," said Richard Chambers. But there was disappointment for Vicky Thornley in the single, and John Collins and Jonathan Walton in the double as they failed to reach their respective finals.